Suddenly, some sort of virus attacks and 95% of the earth's population drops dead. There are a handful of survivors, and they must deal with the fact that everything that they know is gone forever. The entire novel actually spans the first week and a half after the disaster. 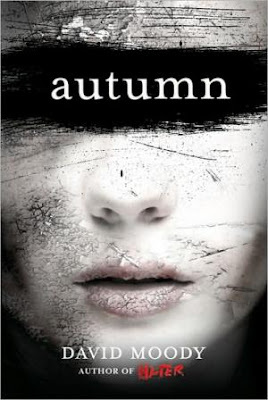 Unfortunately, as with many dystopian books, Autumn is absent GLBT people, people of colour and disabled people. Though this is a common trend, it still reads as genocide of historically marginalized people. How is it that historically marginalized people are always the first to go? It is particularly alarming because in a dystopian setting, the author has the ability to completely remake the world and to fall back into a position where only privileged people survive chooses an extreme lack of imagination and a wallowing in self privilege. The suriviors must first come to terms with the fact that they somehow were not infected by whatever virus attacked the dead. Everywhere they turn are the bodies of the dead, and they serve to remind them of everything that is gone. The survivors are barely accustomed to the change, when the unspeakable happens - the dead begin to rise and walk. At first they are harmless and unaware of their environment, but that does not last long. Autumn is about how one survives, when the world as you know it is gone. Can you deal with the loss of everyone that you loved, and is life even still worth living? Even conversation becomes a struggle, because everything always leads back to the fact that the world is gone. Even though the book covers such a short time period, the characters are so clearly damaged. Each breathe the survivors take is an absolute struggle. Though everything is free for the taking now that society has crumbled, getting food is a danger because of the threat of the zombies. Even everyday necessities like hydro, running water and heat become luxuries. The survivors quickly learn that the things once prized are worthless now, because they do nothing to aid in subsistence. Moody does an amazing job of slowly building the tension of the story. Even though this book is a dystopian zombie story, as a reader, I found that I had no problem identifying with the characters fear. In the end, Michael and Emma are left, and I'm worried that this is going to turn into the typical boy protects girl dynamic that these stories often descend into, because Michael has shown what are very clearly protective urges where Emma is concerned, though there does seem to be an equal division labour between the sexes so far. If you are a fan of The Walking Dead, I think that you will find this book very enjoyable, because it has the very same stark desperateness to it. It is extremely descriptive and reading it, one can almost smell the rot of the dead and the spoiled food swirling the air. Moody's writing is concise, he never uses ten words where one will do, and this gives us a swiftly moving story, though at times it is a touch repetitive in its effort to ensure that the desperateness of the situation, and dark emotions of the characters comes through. I thoroughly enjoyed this story and hope that as it moves into the second book, we will see a greater diversity of survivors. Cover Snark: Bring on the Mantitteh!